Our dining area is not a room we’ve done a lot of work in. It’s not technically a dining room but since it’s the only dining area we have, I call it our dining room. When we moved in, we put in dark hardwood floors. With those floors and two dogs they end up dirty fast. They show everything. So I’ve been working on adding area rugs where I can to make it a little better and it adds such a coziness to a room as well. 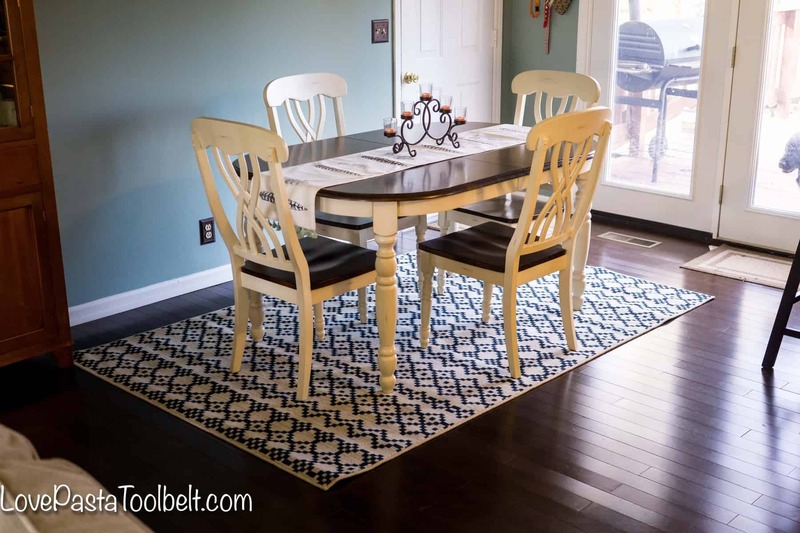 When I decided I wanted to update our dining room a little, I was so excited to add a new Mohawk rug to it. Lately I have a bit of an obsession with all things navy. At first I was afraid that this wouldn’t work with my wall color, but it turns out the two colors really compliment each other. So I picked out this beautiful Mohawk rug from Target to put under my dining room table and chairs. We’ve gotten a new table and chairs since our kitchen reveal and I love what it’s added to our space. Before we had a bar table that only sat four. Now we have a beautiful new table that has a butterfly leaf and matches our kitchen cabinets. I tend to decorate my dining room table based on the seasons. But after Christmas was over I was so over the cold weather so I was ready for a touch of spring. 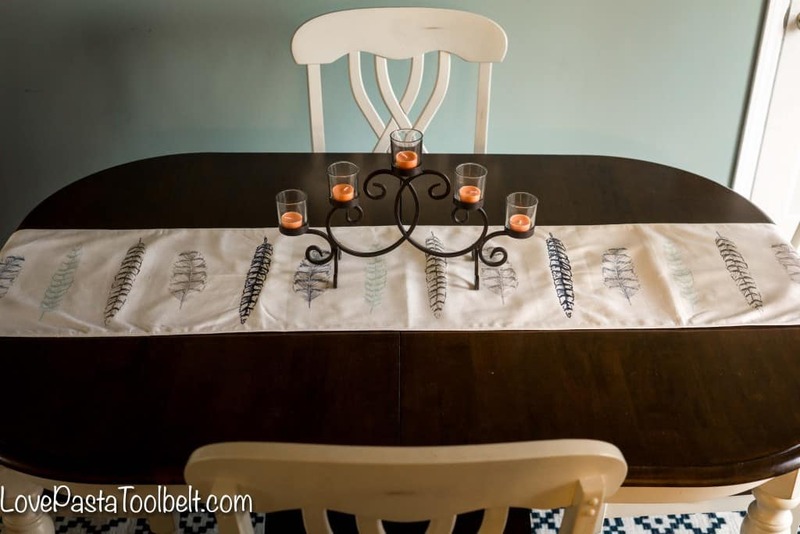 I picked up this beautiful new feather table runner and I love how the colors match our Mohawk rug so perfectly, again more navy. For Christmas my aunt gave me this beautiful candle holder which is perfect. I have been looking for one like this for my dining room table for a long time. I added in the coral candles for a pop of fun color. I love that I can change out the candles for the seasons as I want to change up my table decor. I am seriously so in love with this rug. It has added so much to our space and I can’t wait to find a coordinating one to replace the rug in our living room. And now I have a chance for you to win your very own Mohawk Home Rug, YAY! So enter below and good luck! TERMS & CONDITIONS: Giveaway is open to US residents ages 18 and over and ends at 11:59 ET on February 29, 2016. By entering you give the right to use your name and likeness. Number of entries received determines the odds of winning. Approximate retail value up to $150.00. One winner will be selected. All liabilities and responsibilities with product is directly responsible by Mohawk Home. Winner will drawn by rafflecopter.com from all verified entries, contacted by email provided, and announced on this page at the end of the contest. Winner has 48 hours to respond or prize will be redrawn. Entrant is responsible for the email address they provide, whether through typing it directly or through the Facebook entry method. Love, Pasta and a Tool Belt is not responsible for lost or misdirected emails. All prizes will be awarded. No prize substitutions allowed. This promotion is in no way sponsored, endorsed, administered by, or associated with Facebook and we hereby release Facebook of any liability. Information is provided to Love, Pasta and a Tool Belt, not to Facebook and your information is never sold or shared. Facebook is not a sponsor of this giveaway. Mohawk Home is a sponsor of this giveaway. Prize is awarded directly through Mohawk Home and requires confirmation of delivery. Protected tweets do not count as an entry method for tweeting. Tweets must come from a public account. No purchase necessary. Void where prohibited by law. Thank you again to Mohawk for sponsoring this post and giveaway! My dining room is so bland – it definitley could stand a mini makeover. I think a few simple accessories would do the trick. I love how a few simple accessories can really change a space! I love the mohawk rug! Your dining room looks gorgeous! You have great taste! Thank you so much Kacie! I love how it all came together. It looks so beautiful and I love the rug! Makes me want to head out to Target to get one for me. It’s so beautiful, I just love it! So cute! I love your style and ideas. I’m always looking for ideas for my home. Great pics also. Thank you Laurie! We love how it turned out. I really love the table – I love dark wood and it looks fab in that room!!! The rug adds such a nice touch! I remember when we added ours to our dining room I was so amazed how just adding one thing brought the whole space together. Yours’ turned out great! Yes it is so amazing what a difference it can make! 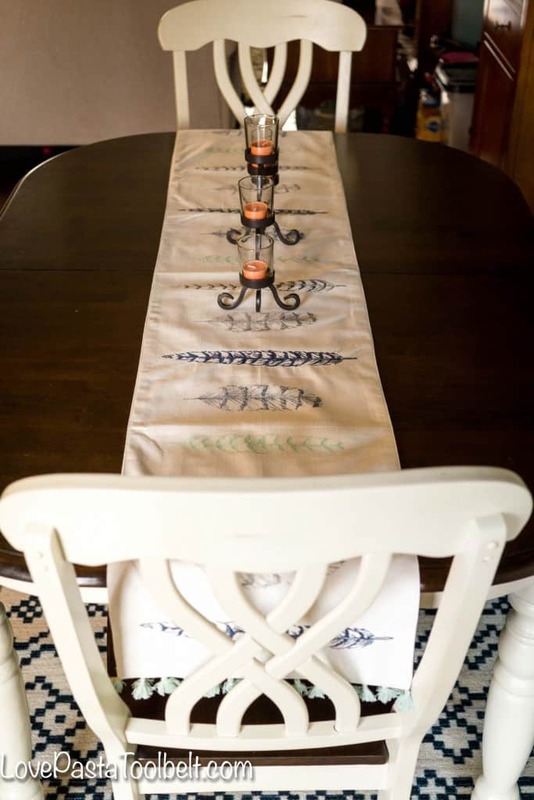 Such beautiful embroidery on the runner and a neat way of displaying the dining room. It’s an important room to decorate and not forget! That mohawk rug is awesome I love it and what you have done with the room. It looks so clean and fab. I like the chairs too! I love navy, too, especially with gray, my new color obsession. Those dark floors are gorgeous but I feel your pain about keeping them clean! Great giveaway! I love the rug. Entering myself! I love the color and pattern design of the rug. I know exactly where I would put it in our house. 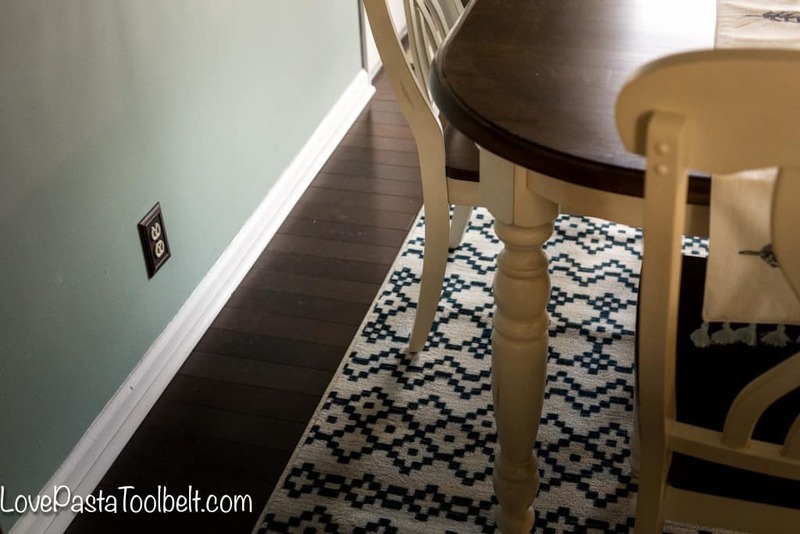 It’s amazing how a simple rug can change the look of the room. Mine needs a face lift, too. I love the rug. Navy is great too. I am a blue girl and so is my husband considering we are from Kentucky. Go cats! Anyway your dining room looks great. I love the dark floors too but I’ve had those and know what you mean about the cleaning. We have three cats. So you know what that means on dark floors. Insert scary face LOL. I feel like my kitchen floors or my kitchen in general is where I’m cleaning the most. Those dark floors are gorgeous but I bet the dirt shows up easily on them which makes all the cleaning understandable! The rug cuts down the similiarity color of the top of table and the dark floor. It gives so much beauty, dus harmonize the whole dining room. You have a beautiful dining room. Looks so comfy and elegant. I really like the rug and table runner you chose to add. The pattern and colors scream “home!” to me. I can’t wait to have a dining area of my own to decorate. Your rug looks beautiful! I would love to get one for my home. Thanks for the giveaway! 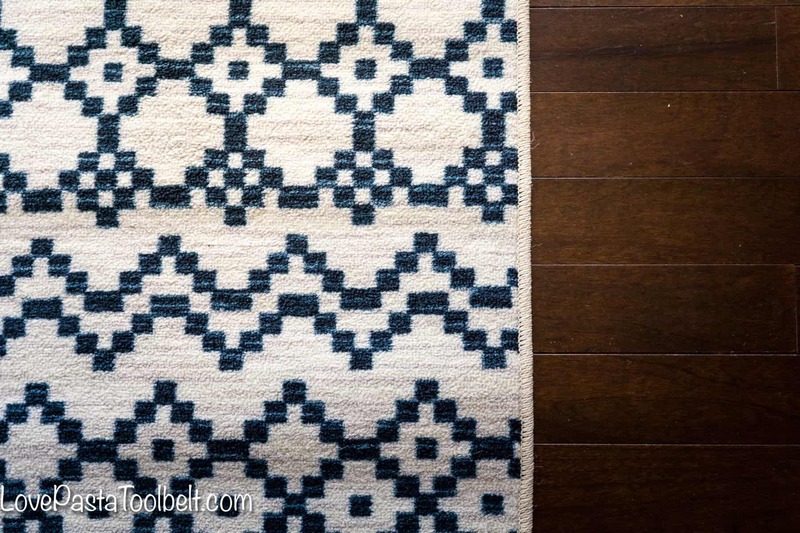 That rug is fabulous; I love Navy/white! I need to update the rug in my dining room, since I bought it cheap from a discount store when we first moved in our house. This is an amazing giveaway! 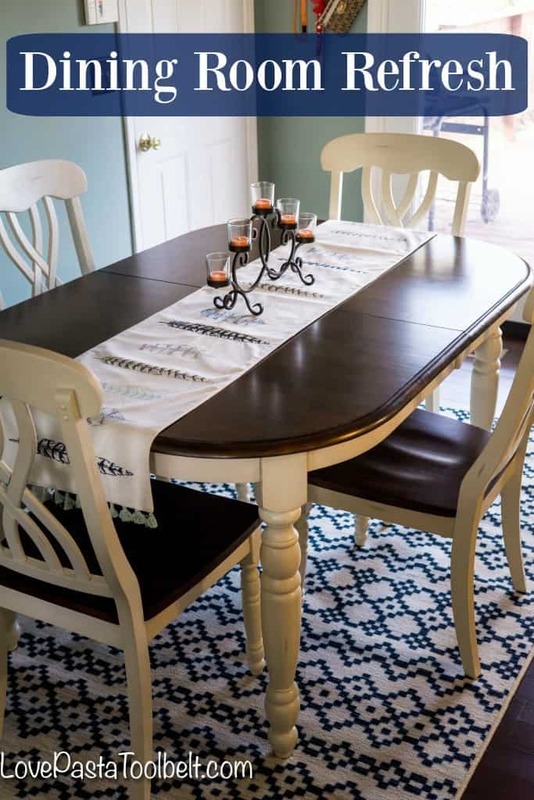 Love how that rug looks in your dining room. So pretty! Great rug! Very pretty. Visiting from Be Inspired party. As you can see, I have a big dog,too, so I like to keep things fresh and simple and easy to clean. Your makeover is perfect! Thanks for sharing this with us on Throwback Thursday last week!